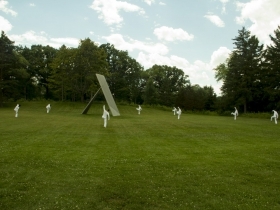 Her company’s performance at Lynden Sculpture Garden moved Manhattan minimalism to post-card pastoralism. The Early Works: Conversations with Sculptures. Photo by W. C. Tank. Ominous skies threatened to drown out the second performance of Trisha Brown Dance Company’s The Early Works: Conversations with Sculptures on Sunday; instead, the day’s first storm rolled through and left a sheen of sunshine in its wake at show time. 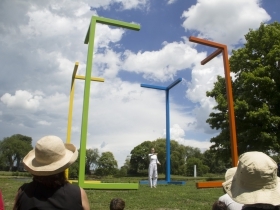 In fact, the weather operated as something of a set designer at Lynden Sculpture Garden – coating the landscape in gooey humidity for most of the performance until casting a shadow and releasing another quick storm. But before running for cover, we were treated to a delightful summer afternoon performance by the Trisha Brown company. I’ll admit to never having been to the Lynden, where lush greens and marshy ponds all but demand you forget your worries and run barefoot through the grass. This sentiment seemed to be shared by the affable company dancers, who opened with a hypnotic “Figure 8” (1974). The piece was easy and soothing, accompanied only by a metronome and the pastoral scenery. Standing in a roomy line, their arms moved above their heads without hurry, curved and relaxed, barely touching fingers to head before coming down again. 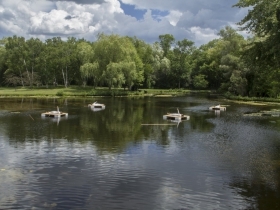 Next came “Scallops” (1973), with five of the dancers tracing the border of a nearby pond, running ahead of their partners in single file, chasing the line and creating new starts and ends. As a spectator, I suppose it may have been important to watch the dances through the lens of history, to keep in mind these are “Early Works” that had been repurposed. I fluctuated between focusing on this and pushing it from my mind altogether, and experienced about the same result. The dances carried on in a timeless tone, revealing nothing about their origin. From either perspective, it was minimalist, postmodern dance. Brown is one of its pioneers, a founding member of the avant-garde Judson Dance Theater in 1962, where she worked with the likes of Twyla Tharp, Yvonne Rainer and Lucinda Childs. Brown created her own dance company in 1970, and these were some of the early works by a choreographer who went on to win a MacArthur Foundation “genius” grant. In this setting, with white costumed figures set against a field of green, the dances likely looked different then when first performed. “Sticks IV” (1973) and “Sticks I” (1973) revealed the dancers in what could have been a rehearsal, as they used teamwork to line up long, thin wooden posts. First in a low, floating line that ended against a tree, and then in a pyramid formation where the dancers lowered their bodies, balancing the posts until they could bend a leg back to touch their foot to the wood. They smiled at each other, giggled when they screwed up, alerted each other to “hold,” “reset,” and “go.” It carried a conversational, happened-upon-it tone that had the audience rooting for the success of the arbitrary tricks. “Accumulation” (1971) featured a lone dancer set inside one of the larger installations at Lynden, moving in a very small personal box to Grateful Dead’s “Uncle John’s Band.” The combination of sunshine and rock music made each subtle move seem grand, each shift in choreography surprising. We followed the company to an open lawn where they spread out, then moved in unison to the natural soundtrack of birds and creeping thunder. The moments unfolded in freeze-frames, each step carefully executed but languid. “Spanish Dances” (1973) was the nicest part of the day, featuring five female dancers in a spaced line, all facing forward. The dancer at the back of the line began a subtle cha-cha to “Early Mornin’ Rain” performed by Bob Dylan, raising her arms up slowly and sashaying nearer to the motionless dancer in front of her. As her hips finally moved into her partner, she launched into the same dance by association, and they both moved forward, slowly on down the line until the chain was completed. Just as they reached their finish, the skies opened up and brought the afternoon to a stormy end. You couldn’t ask for a more dramatic, if premature, finale. Wonderful performance in an outstanding setting. I saw the first show- it was magical. Thanks to David Ravell and Polly Morris!